Genetics: How Far is Too Far? 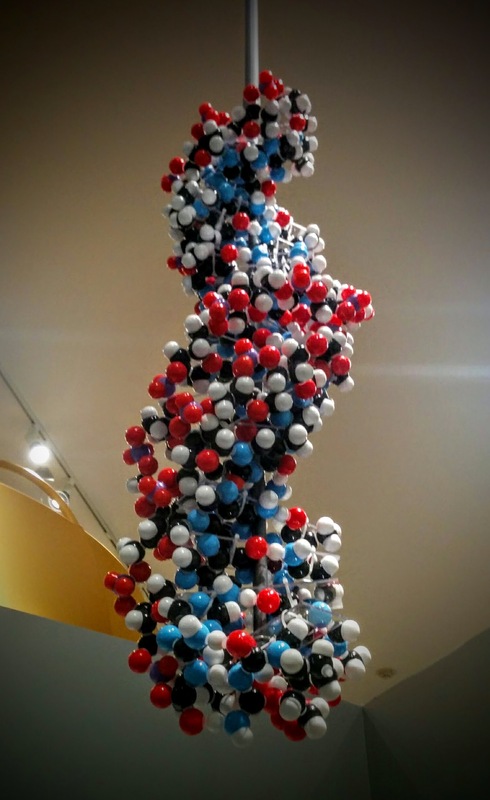 In our current exhibit, “Beyond Chicken Soup: Jews and Medicine in America,” there is a section about genetics. One half of the section focuses on Eugenics and the other on genetic predisposition in the Jewish population, particularly Tay-Sachs. These two big ideas create tension with each other and stage an important conversation on genetic screening. Should we do it? Does it matter? Is the expense worth it? An interactive screen asks these types of questions to our visitors. Ashkenazi Jewish heritage is a risk factor for several recessive genetic diseases including but not limited to Tay-Sachs Disease, Canavan Disease, and Niemann-Pick Disease. More recent research shows a connection with Crohns Disease, Ulcerative Colitis, and an increased risk of developing Parkinson’s disease. Before genetic testing was possible and doctors understood the importance of DNA, they understood that somehow parents pass down similar traits to their offspring. This idea developed into the eugenics movement, claiming that some people were better than others. The positive outlook on eugenics claimed that two desirable people would create desirable offspring, but in order to make sure that only desirables reproduced the theory claimed that some people should not have children. This outlook was popularized by the Carnegie and Rockefeller Foundations as well as many medical professionals who legitimized the movement. Combined with the efforts of these foundations and reputable medical endorsements, eugenics was spread throughout public social awareness. It was responsible for the voluntary and forced sterilization of over 60,000 Americans in the early twentieth century. 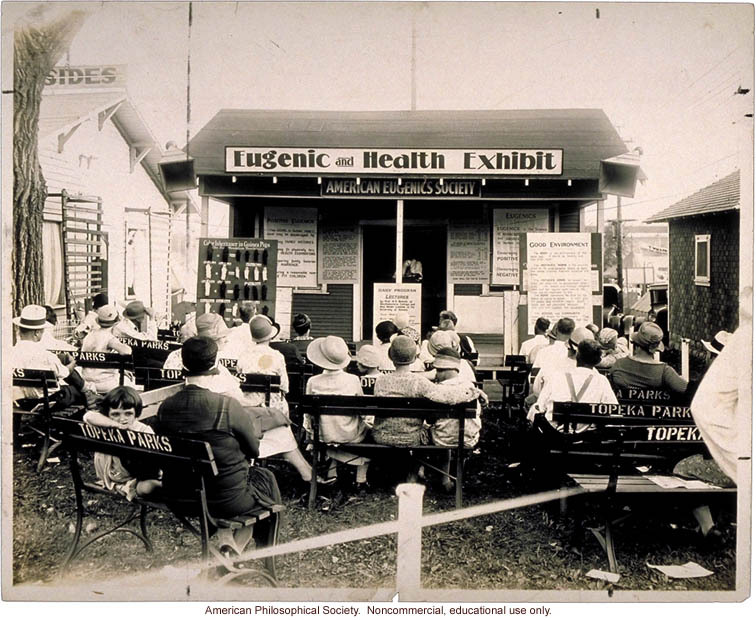 Eugenic and Health Exhibit, Kansas Free Fair, 1929. Courtesy of the American Philosophical Society. Eugenics quickly declined when it was declared a crime against humanity after the Second World War when the German government had used it as a justification for their unethical sterilization and euthanizing policies, but its memory casts a dark shadow over current genetic debates. Where is the line? Should people be able to use their genetic predispositions to decide their future? These tests, if taken by the whole population, could be used as an encouragement to create the optimum population. Some worry that genetic testing would lead to another government sterilization operation. 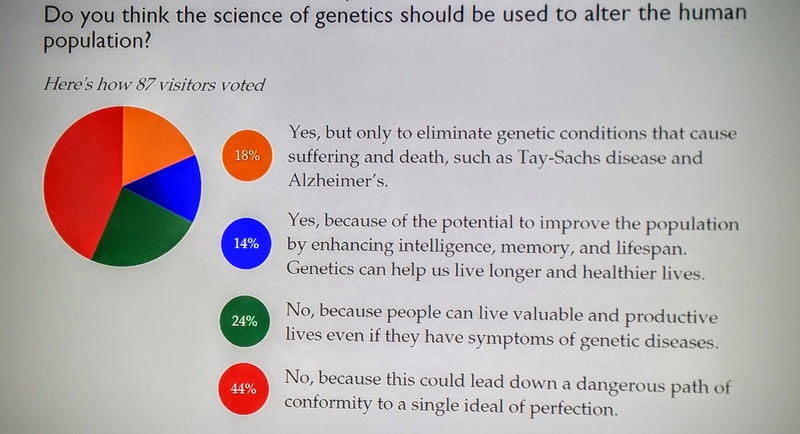 When our guests take the internal question survey, the last question they answer is “Do you think the science of genetics should be used to alter the human population?” There are four possible answers and an overwhelming 44% has selected “No, because this could lead down a dangerous path of conformity to a single idea of perfection.” Still a significant 32% believes that we should use genetics to alter the population. If genetic alteration is a reality, where is the line? These questions are academic, but they are also moral. If you lived with genetic markers for a condition that could potentially cause pain and suffering for your children, would you choose to have them? Would it make a difference? The debate will continue. I was recently diagnosed with Crohn’s Disease, an event that’s likelihood was four times more likely because of my Jewish ancestry. No one in my immediate family has it, but my heritage increased my risk. If my mother found out there was a visible chance she could have a child with Crohn’s and decided not to have biological children, I would not be alive. On the other hand, a parent with Crohn’s has a 10% chance of passing their disease on to their children if their partner does not have Crohn’s and a 50% chance if both parents have Crohn’s. Many factors, including quality of life can be taken into account. Medications and treatments get better every year and someone with Crohn’s still has the ability to live a very full life. Is it the responsibility of the government to prevent those with hereditary diseases from having children or should the decision remain a personal one? It is my hope that eugenics does not repeat itself, for both ethical and personal reasons. Post by JMM Intern Rebecca Miller.